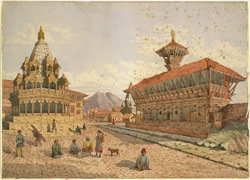 Watercolour of the Krishna temple in Lalitpur (Patan), Nepal by Henry Ambrose Oldfield (1822-1871), c.1855. The image is inscribed on the front in ink: 'H.A. Oldfield. Nepal'; on the back in a later hand:' (Temple of Vishnu. Patun'), further notes accompany image. Lalitpur, the 'City of Beauty' was founded in the 2nd century by the Kirats and it remained a valley kingdom until the late 15th century when it became a sovereign state, together with Kathmandu and Bhaktapur. All three were built around Durbar Squares containing Palace and Temple complexes. The Krishna Mandir Temple, on the left in this image, was built in 1637 by Siddhi Narasingh Malla, who is said to have dreamt that Krishna and Radha, one of the incarnations of Vishnu and his consort, appeared in front of his palace and so he erected a temple on that spot. The interior is decorated with sculpted scenes of the Ramayana, a Hindu epic. The artist, Dr Oldfield, was Residency Surgeon at Kathmandu from 1850-1863. After his death his family published his two volume 'Sketches from Nipal, Historical and Descriptive...' (1880), which described life in the court of the Maharajah Jung Bahadur and also contained descriptions of Buddhist architecture, together with illustrations from Oldfield's own drawings.